The guide is a hands-on resource providing valuable information to help prevent businesses and individuals from becoming a victim of crime. The guide was first printed in 2008 with excerpts from the original Winnipeg Police Service Counter-Action Handbook incorporated into the content. The popularity of the guide saw several updated versions produced since then to include new information for addressing emerging challenges such as identity theft and point of sale fraud. 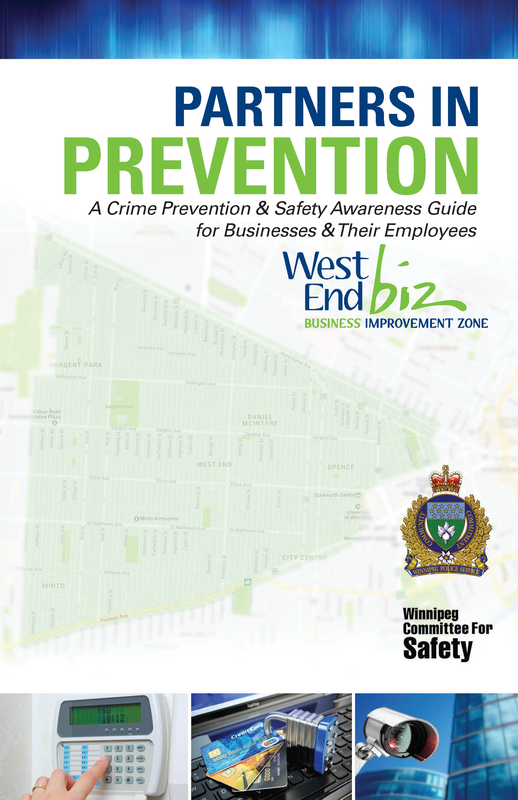 This latest guide, released November 2017 for Crime Prevention Month offers the most comprehensive information to date. Our thanks and appreciation to the Winnipeg Police Service for their assistance and support, and to the Winnipeg Committee for Safety for their funding assistance. “This easy to read guide can help prevent an individual or business from becoming a victim of crime, and prepare you if one does happen. I consider it a valuable tool for my staff. Every business owner should have one and everyone should read it,” adds Jeremy Epp, of Independent Jewellers, a proud West End business.